Automotive marketers have a massive job in front of them to convince consumers to get on board with autonomous vehicles, Toyota’s CMO Wayne Gabriel has said. Gabriel said even though there were 1,200 deaths on Australian roads last year, the second machines are involved, every death creates doubt and becomes an ethical dilemma. “The development of autonomous vehicles controlled by AI [artificial intelligence], means we are asking customers to take an enormous leap of faith. 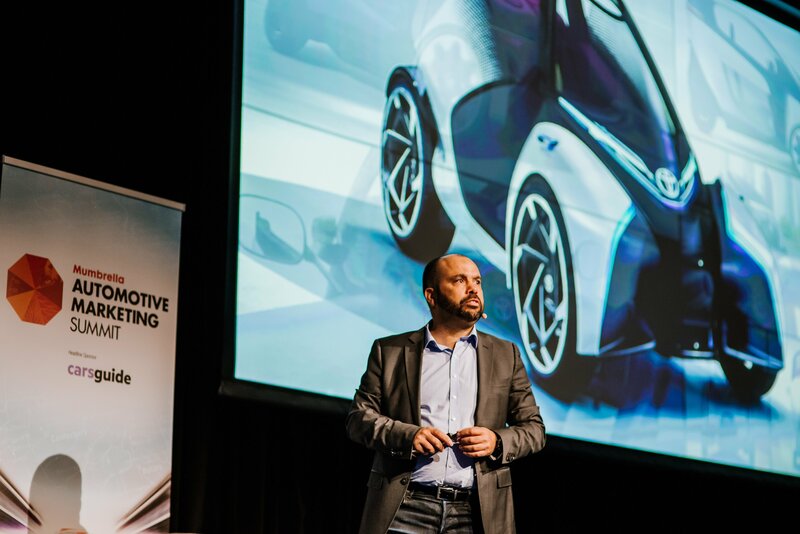 We are asking them to trust us – that our products are reliable, efficient, convenient, and above all, safe,” Gabriel said at Mumbrella’s Automotive Marketing Summit. “For people to make a leap of faith, autonomous driving will need to provide greater safety than their current vehicles – and not just slightly different. It needs to make significant improvements… When control is taken out of the hands of people, just one death has the ability to create doubt,” he said, citing a pedestrian death in Arizona at the ‘hands’ of a self-driving Uber. “When that decision [about who or what to hit] is left to a machine, it raises serious questions about ethics and responsibility. That then feeds into legal, insurance and regulatory concerns,” he said. Society demands machines which are faultless, Gabriel said, which will take time. Australian automotive marketers have an especially difficult road in front of them, as Australians are not as keen on autonomous vehicles as some of their international counterparts, he said. “Australians are definitely among the most skeptical when it comes to autonomous vehicles. “A recent study by Ipsos found that only 25% of Australians ‘can’t wait’ for the introduction of autonomous vehicles. The majority of Australians, 59%, were unsure… and 16% said they would never get into a car that’s driven by a machine – self-driving. “So we still have a huge job to do to get consumers on board,” he said. To do so, marketers and automotive marketers will need to curtail their excitement so as not to overpromise and underdeliver on what the immediate future holds, he said. “We need to take our customers on a journey. We need to educate and inform them. We need to provide them with realistic expectations of what are the possibilities. And in doing that, we can excite and inspire them to embrace the opportunities,” he said. Despite the mammoth job in front of automotive marketers, Gabriel said they should be excited to be part of “the biggest transformation since the industrial revolution”. I agree with this and do not just take it as spin from a ‘traditional’ car manufacturer. When I am sitting in the front passenger seat of a normal car, at least I can be a second set of eyes and yell for the driver to “BREAK!! !” if need be, as a child jumps out, on a busy street, from between some parked cars. Secondly, on a highway and travelling 110km p/h, I might spot the kangaroo, which is just about to jump over the central reservation, into our lane. If we look at the driverless transport that we do use, such as a monorail, (or London’s ‘Docklands Light Railway’), there is nothing that can cross the path of these vehicles… It will be interesting to watch.